Haikou Banana Hostel was opened by an English man and his Chinese wife in 2007. We are the first official International Youth Property opened by a foreigner in the whole of China. We are also the first Hostel in Haikou. We offer simple, clean rooms. You can stay in either the dormitory or a private room. Our rooms consist of a bed, desk, private shower, toilet and sink etc. Some rooms have Chinese style toilet while others have Western style. All rooms have air-con and TV. The ground floor is a communal area. There is free wi-fi, a TV with large collection of DVDs, pool table, ping-pong, internet computers and a small garden area where you can sit outside. We also have probably the biggest collection of English language books for exchange in the whole of Hainan (200-300 books). We have simple western food served from 08:00 - 12:45 in the mornings and in the evenings Wednesday to Sunday 18:00 -21:00 we have authentic Italian pizza and pasta. Look at a map of Haikou and you can see the Banana hostel is located in a geographically interesting area in the north of Haikou called Haidian Island (海甸岛, Hǎi diān dǎo). It is actually a separate island about 3 x 5 km in size. 30 years ago Haidian Island was little more than a fishing village and grazing pasture. Today Haidian Island is rapidly developing and has become a popular, convenient place to stay. 1.7 km to the north of Banana Property is the new Baishamen Park, stroll a few hundred metres through the park and you arrive at the sea. Walk 1km south of Banana Property and you arrive at Haidian River, where lots of traditional wooden fishing boats anchor. In the afternoon the boats return and sell their catch in small markets on the river shore. Cross the bridge over the river and you arrive at the Bell Tower (钟楼, Zhōng lu) and the start of the historic old centre of Haikou. Here you can explore the maze like network of the distinctive decaying Qilou architecture and find real life community temples hidden in the back alleys. You can also discover weird and exotic food for sale at the Dong Men market in this area (live Cobra snakes for example). Continue south and you will see East Lake and Haikou Park. If you are interested in Chinese martial arts you can see local practitioners of Push Hands (推手, Tuīshǒu) at Haikou Park in the morning. Cross the road from the park and you are in one of the main busy shopping areas. Banana Property suggests you rent one of our bikes and cycle through the city to the west coast. You must be careful cycling through the city, but after a few kilometers there is a long coastal path with the sea, beach, and palm trees in sight. 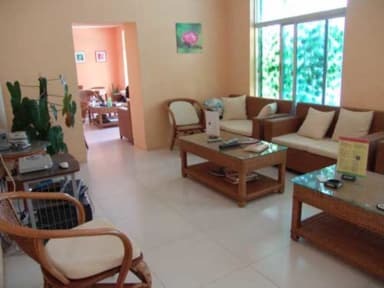 Banana Property is very close to the main campus of Hainan University (海南大学, Hǎinn dxu). If you want to improve your Mandarin, the University has lessons for foreigners of all levels. We are less than 1km from both the south and east gate entrances. The south gate entrance (南门, Nan men) is also a bustling street food area. In the evening there are many street snack foods to try. There is also a long line of tropical fruits stalls, Chinese restaurants, and a KFC on the same road. If you want to try the local beer, Heping Avenue (和平大道, Heping dadao) Bar Street is just 1km to the east of Banana Hostel. Here there are many small local style bars serving beer from around 6RMB. These bars open in the evening and stay open late. In the evening many small BBQs also open. You can get fresh BBQ seafood, chicken, sweetcorn etc for very reasonable prices.